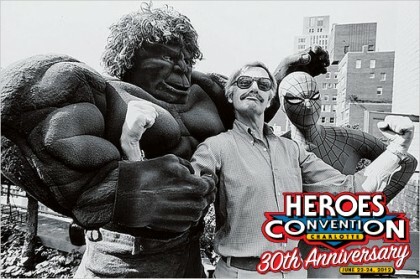 THE HEROESONLINE BLOG | HEROESCON 2012 :: STAN LEE VIP PACKAGES! HEROESCON 2012 :: STAN LEE VIP PACKAGES! Last week we announced that Stan Lee would be attending HeroesCon 2012, June 22-24, 2012. Please note that anyone who attends the show will be able to meet Stan and purchase an autograph or a photograph with Stan the Man. Stan will also be featured on a panel one of the days that he is here which all convention guests are welcome to attend. But, if you want to guarantee you get an autograph, photo and more from Stan and you don’t want to wait in what we’re sure will be long lines for this living legend we are making two levels of VIP access available to you! You can purchase “True Believer” and “Excelsior” passes now by clicking here. The “True Believer” pass will allow the holder to one photo with Stan, one certified autograph, express lane for photos and autographs and priority seating at Stan’s panel. The “Excelsior!” pass will provide all of the above as well as admission to an intimate “meet and greet” cocktail party with Stan Lee. In addition to the guaranteed access, one lucky “True Believer” or”EXCELSIOR” pass holder will be chosen at random to be in Stan’s entourage all day Saturday. That lucky winner will be with Mr. Lee all day as he signs autographs, poses with fans for photos, walks with Stan to his panel discussion and will be included in a very exclusive lunch with Stan on Saturday! We’re so excited Stan Lee is coming back to Charlotte to help us celebrate our 30th Anniversary and we know you are too! Don’t miss your opportunity to meet this legendary creator! Please note: There are 2 different versions of the Stan Lee ticket on the site. One pair is an upgrade if you already have already purchased your 3-day pass and the others include 3-day admission plus the Stan related upgrades! ← HEROESCON GUEST LIST UPDATE :: ED MCGUINNESS! BILL WILLINGHAM! CREATUREBOX! & MORE!